Review Summary: LAGE RAHO MUNNABHAI is brilliant. Its funny and a fantastic commentary on today's society. Not to be missed! The adorable rogue is back. 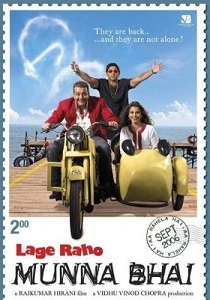 On the whole LAGE RAHO MUNNABHAI is a sparkling follow up to MUNNABHAI M.B.B.S. Munna and Circuit are back! Raj kumar Hirani does it again. A very impressive film which can be watched by everyone from a kid to an old person it can be called as a Family Film with nothing offending at all. The team of Munnabhai MBBS is back with Lagey Raho Munnabhai. Three years ago a local goon Munnabhai along with his sidekick Circuit was projected on the silver screen. Will Munnabhai change society with his thoughts? Can Gandhian principles work in today's world? Watch Munnabhai, and you will know. Not only do they make you laugh uncontrollably, they even manage to pass on a beautiful message with a deeper meaning and purpose! Munna and circuit start off where they left, i.